In vitro adherence assays can be used to study the attachment of Streptococcus pneumoniae to epithelial cell monolayers and to investigate potential interventions such as the use of probiotics for inhibiting pneumococcal colonization. Dunne, E. M., Toh, Z. Q., John, M., Manning, J., Satzke, C., Licciardi, P. Investigating the Effects of Probiotics on Pneumococcal Colonization Using an In Vitro Adherence Assay. J. Vis. Exp. (86), e51069, doi:10.3791/51069 (2014). Adherence of Streptococcus pneumoniae (the pneumococcus) to the epithelial lining of the nasopharynx can result in colonization and is considered a prerequisite for pneumococcal infections such as pneumonia and otitis media. In vitro adherence assays can be used to study the attachment of pneumococci to epithelial cell monolayers and to investigate potential interventions, such as the use of probiotics, to inhibit pneumococcal colonization. The protocol described here is used to investigate the effects of the probiotic Streptococcus salivarius on the adherence of pneumococci to the human epithelial cell line CCL-23 (sometimes referred to as HEp-2 cells). The assay involves three main steps: 1) preparation of epithelial and bacterial cells, 2) addition of bacteria to epithelial cell monolayers, and 3) detection of adherent pneumococci by viable counts (serial dilution and plating) or quantitative real-time PCR (qPCR). This technique is relatively straightforward and does not require specialized equipment other than a tissue culture setup. The assay can be used to test other probiotic species and/or potential inhibitors of pneumococcal colonization and can be easily modified to address other scientific questions regarding pneumococcal adherence and invasion. Streptococcus pneumoniae (the pneumococcus) is a Gram positive bacterium that can cause infections including pneumonia, otitis media, and meningitis. It is a major cause of disease in children in low-income countries and responsible for an estimated 800,000 deaths of children under the age of five annually1. Pneumococci are frequently carried in the nasopharynx of young children. Although this colonization is generally considered asymptomatic, it precedes pneumococcal infection and serves as a reservoir for the bacteria in human populations2. Pneumococcal conjugate vaccination effectively reduces carriage of the serotypes contained within the vaccine. However, there are over 90 pneumococcal serotypes, and vaccination can lead to serotype replacement, whereby the elimination of vaccine serotypes is followed by a rise in carriage and disease caused by nonvaccine serotypes3. Also, in some high-risk populations, pneumococcal colonization often occurs very early in life, prior to administration of the first vaccine dose4,5. Recently, the use of probiotics has been proposed as an additional strategy to inhibit pneumococcal colonization6,7. In vitro adherence assays have been used to examine pneumococcal adherence8,9. These assays have been adapted to investigate the impact of the probiotic Lactobacillus rhamnosus GG (LGG) on pneumococcal adherence10. In addition to LGG and other lactic acid bacteria, Streptococcus salivarius, a common resident of the oral cavity, has been investigated as a potential probiotic for the respiratory tract due to its colonization potential and ability to inhibit pneumococci and other respiratory pathogens in vitro11-13. The protocol presented here describes an adherence assay used to investigate the effects of S. salivarius K12 on pneumococcal adherence to the human epithelial cell line CCL-23. Prior to use in the assay, pneumococcal isolates were evaluated for adherence capabilities, as growth and adherence properties can vary substantially among isolates10,14. Growth curves of pneumococci and S. salivarius were performed to determine mid-log phase and estimate concentration (colony forming units or CFU/ml) by optical density (OD, Figure 1). It is recommended to examine growth by viable count and OD for each isolate prior to use in the assay. This assay can be performed in any laboratory with standard tissue culture facilities and equipment. In this protocol, the effects of three doses of S. salivarius administered 1 hr prior to the addition of pneumococci on the adherence of S. pneumoniae PMP843, a serotype 19F carriage isolate derived from a nasopharyngeal swab, are examined. Two different ways to quantify adherent pneumococci are presented: plating on blood agar to determine viable counts, and DNA extraction and detection of the pneumococcal lytA gene by qPCR15. The basic adherence assay protocol can be easily modified to test different doses or time of administration of probiotics and can also be used with other bacterial strains or species. Prewarm Minimum Essential Media (MEM) containing 10% Fetal Bovine Serum (FBS) in a 37 °C water bath for ~30 min. Sterilize the tissue culture-approved biosafety cabinet with UV light for at least 10 min before use, and wipe down the work area with 70% ethanol. Wipe the warmed media bottle with 70% ethanol and place in biosafety cabinet. Using a 25 ml pipette, transfer 14 ml of media into a T-75 flask. Place flask in 37 °C incubator whilst cells are thawing (section 1.1.4). Remove a vial of CCL-23 cells from liquid nitrogen storage using appropriate safety precautions and warm in a 37 °C water bath until ~80% thawed. Return the flask prepared in section 1.1.3 to the biosafety cabinet. Wipe outer surface of vial of CCL-23 cells with 70% ethanol and transfer contents (1 ml) into the T-75 flask using a P1000 pipette. Incubate the flask on its side in a 37 °C, 5% CO2, 95% relative humidity tissue culture incubator overnight (16-20 hr). Check the cells under a microscope to confirm a healthy morphology, remove media, and replace with 15 ml fresh, prewarmed MEM + 10% FBS. Once cells are ~80% confluent (1-2 days), passage by removing media using a 25 ml pipette and gently wash the cells twice with 8-10 ml prewarmed phosphate buffered saline (PBS) using a 10 ml pipette. Remove PBS and add 1 ml of sterile 0.25% trypsin-EDTA (0.25% (w/v) trypsin, 0.1 mM EDTA). Turn flask on its side, rotate to ensure trypsin covers the confluent layer of cells, and incubate the flask for 2-3 min in the 37 °C, 5% CO2 incubator. Return flask to the biosafety cabinet, add 9 ml prewarmed MEM + 10% FBS, and pipette up and down 6-8x to resuspend the cells, ejecting liquid down the side of the flask to dislodge cells. Split cells 1:15 (1 ml + 14 ml MEM + 10% FBS) or 1:30 (0.5 ml + 14.5 ml MEM + 10% FBS), discard excess cells, and return flask to the 37 °C, 5% CO2 incubator. Passage the cells at least twice before use in the adherence assay. Typically cells are split every 3-4 days. Split confluent cells as described in sections 1.2.1-1.2.3, resuspending in prewarmed MEM + 5% FBS (FBS concentration is lowered to reduce the likelihood of serum components interfering in the assay). Remove 20 μl of cells and count using trypan blue staining and a hemocytometer. Dilute cells in prewarmed MEM + 5% FBS to a concentration of 1.5 x 105 cells/ml in a sterile 50 ml tube. Seed 1 ml of cells/well in a tissue-culture treated 24-well plate. This procedure can be followed for preparation of pneumococci and S. salivarius. Bacterial growth media is typically kept in a 37 °C incubator overnight to prewarm and test for sterility (generally will appear cloudy if contaminated). Two days prior to adherence assay, streak bacteria on horse blood agar (HBA) plates and incubate at 35-37 °C and 5% CO2 for 18-24 hr. Sheep blood agar can be used as an alternative. The following day, prepare an overnight culture for each bacterial species by pipetting 10 ml Todd-Hewitt Broth with 0.5% yeast extract (THB+YE) medium into a sterile 30 ml tube. Using a 10 μl loop, inoculate approximately 10-12 well separated colonies. Briefly vortex and incubate at 35-37 °C and 5% CO2 for 14-16 hr. Note that pneumococci will autolyze if left too long in broth culture. Pipette 10 ml of prewarmed THB+YE into each of two sterile 30 ml tubes, one labeled pneumococci and the other S. salivarius. To reach mid-log phase, pneumococci require ~3 hr and S. salivarius require ~2 hr incubation (see Figure 1). Start both cultures at the same time. Vortex (3-5 sec) overnight bacterial cultures and add 100 μl pneumococci and 100 μl S. salivarius into corresponding tubes. Briefly vortex and incubate the cultures at 37 °C for approximately 2 hr for S. salivarius and 3 hr for pneumococci. Using an inverted microscope, check the 24-well plate for confluent monolayers with healthy cell morphology. Monolayers should be >80% confluent, without evidence of cell clumping or cytopathic effects such as cell rounding or loss of adherence (see Figure 2). Remove the media in each well using a transfer pipette, tilting the plate slightly to avoid disturbing the cell monolayer. To gently wash the cells, add ~500 μl prewarmed PBS into each well using a serological pipette and remove it with a transfer pipette, tilting the plate slightly. Discard the PBS. Repeat wash step once. Add 500 μl of prewarmed MEM + 5% FBS into each well. Return the 24-well plate to the CO2 incubator while preparing the bacterial cultures. Note: To determine the exact CCL-23 cell number for multiplicity of infection (MOI), two wells can be trypsinized and counted on the day of infection. Add pneumococci to the CCL-23 cells at a MOI ~10:1. Test the conditions listed in Table 1 in duplicate wells. Measure the optical density at A600 (OD) of 1 ml of S. salivarius culture. OD should be between 0.3-0.6. Transfer 5 ml of S. salivarius culture into a 10 ml tube and centrifuge at 1,870 x g for 4 min. Discard the supernatant and based on the OD reading in section 3.1.1, resuspend S. salivarius in 200-1,000 μl of 0.85% NaCl (final concentration ~1.5 x 109 CFU/ml). As a general guideline, an OD of 0.375 will be resuspended in 260 μl. Prepare 1:10 and 1:100 dilutions of S. salivarius using 0.85% NaCl. Note: In total, three concentrations (representing high, medium and low doses) of S. salivarius will be tested in the assay. The high dose is a ratio of ~10 S. salivarius : 1 pneumococci, the medium is ~1 S. salivarius : 1 pneumococci, and the low is ~1 S. salivarius : 10 pneumococci. Take out the 24-well plate from the incubator. From the heparin control wells, remove 40 μl of media and add 50 μl of heparin (1,000 U/ml stock concentration) for a final concentration of 100 U/ml. Add 10 μl of 0.85% NaCl to wells containing CCL-23 cells only and wells containing CCL-23 cells and pneumococci (no S. salivarius). Add 10 ul of undiluted, 1:10 and 1:100 of S. salivarius to respective wells. Note: S. salivarius can also be added at the same time as pneumococci (coaddition) or 1 hr after pneumococci (post-addition) to examine the effect of time of probiotic administration. Centrifuge the 24-well plate at 114 x g for 3 min to promote bacterial contact with the cell layer and incubate for 1 hr at 37° C, 5% CO2 . Perform serial dilution of the S. salivarius stock in 0.85% NaCl and plate on duplicate HBA plates for viable counts. First, add 50 μl of stock to 450 μl of 0.85% NaCl to make a 10-1 dilution, then pulse vortex (5 sec), change tips, and add 50 μl of the 10-1 dilution to 450 μl of 0.85% NaCl to make a 10-2 dilution and so forth up to 10-7. Plate 100 μl of the 10-5, 10-6, and 10-7 dilutions in duplicate on HBA plates and spread with a sterile spreader. Incubate HBA plates inverted overnight at 37 °C, 5% CO2. Towards the end of the 1 hr incubation, repeat sections 3.1.1-3.1.3 for pneumococci. ODs should be between 0.2-0.7. Spin down 1 ml of pneumococcal culture and resuspend the pellet in 300-2,000 μl of 0.85% NaCl (based on the OD reading) to a concentration of ~1.5 x 108 CFU/ml. As a general guideline, an OD of 0.3 will be resuspended in 500 μl. After 1 hr incubation with S. salivarius, add 10 μl undiluted pneumococci to all wells except negative control wells (containing cells only). Centrifuge the 24-well plate at 114 x g for 3 min and incubate at 37 °C, 5% CO2 for 3 hr. Perform serial dilution of the pneumococci stock in 0.85% NaCl as described in section 3.1.9 and plate dilutions 10-4, 10-5, and 10-6 on duplicate HBA plates for viable counts. After 3 hr, check the cells under a microscope to ensure that monolayers look healthy (see Figure 2). Remove the media from each well and gently wash the cells 3x as described in section 2.2.3. using a different pipette for each condition. This step is essential to remove nonadherent pneumococci. The monolayers should not come apart during the washing process; this can be confirmed by checking again under a microscope. Note: Media removed during this step can be stored at -20 °C for additional analyses (e.g. measurement of cytokine levels). Add 200 μl of 0.1% digitonin (a gentle detergent) to each well and incubate for 7 min at 37 °C, 5% CO2. Add 800 μl of THB media to each well. Lyse cells by pipetting up and down, and, if necessary, scrape wells 3-4x with the pipette tip to make sure the cell monolayer is completely removed. Change tips between wells. Remove the contents from each well using a P1000 pipette and transfer into labeled microfuge tubes. Adherent pneumococci can be quantified by determining viable counts (serial dilution and plating on blood agar) or by quantitative real-time PCR. This method must be performed immediately after step 3.5 of the adherence assay. For each assay well, prepare serial dilutions of samples collected in step 3.5 of the adherence assay by adding 50 μl of samples to 450 μl of 0.85% NaCl, pulse vortexing, and serially diluting as described in section 3.1.9 up to the 10-6 dilution. Plate 100 μl of the 10-3, 10-4, 10-5, and 10-6 dilutions in duplicate on blood agar, spread with a sterile spreader, and incubate inverted plates overnight at 37 °C, 5% CO2. Note that the wells containing CCL-23 cells alone should not contain any bacteria and can be plated neat (100 μl undiluted) as a sterility control. The following day, determine the pneumococcal inocula by counting the colonies on the appropriate dilution plates (containing 30-300 colonies) prepared in section 3.1.13 of the adherence assay. Calculate the CFU/ml of the inocula using the averaged value from two plates. Similarly, determine the S. salivarius inocula by counting the colonies on the plates prepared in section 3.1.10. Note: Plates should contain pneumococci only; the presence of other species indicates that the assay was contaminated and results are invalid. To determine the pneumococcal adherence levels, count the appropriate dilution plate (containing 30-300 pneumococcal colonies) for each sample prepared in section 4.1.1. Note that S. salivarius colonies will be small and white, whereas pneumococci will be flat and greenish due to α-hemolysis, as shown in Figure 3. To calculate pneumococcal adherence, normalize the number of adherent pneumococci from condition b. CCL-23 cells + pneumococci to 100%, and compare adherent pneumococci from other conditions to this condition. Samples collected in Adherence Assay step 3.5 can be stored at -20 °C until DNA extraction. DNA extraction is performed using a commercial kit and described in sections 4.2.1-4.2.9 and the qPCR assay in sections 4.2.10-4.2.20. Prepare Enzymatic Lysis Buffer (50 mM phosphate buffer pH 6.7 containing 1 mg/ml lysozyme, 0.075 mg/ml mutanolysin, and 2 mg/ml proteinase K). The following recipe can be used make 10 ml (enough for 50 extractions). Enzymatic lysis buffer should be freshly prepared prior to use. Thaw the samples on ice or at 4 °C. Vortex and transfer 100 μl aliquots of each sample into labeled microfuge tubes. Return original samples back into the -20°C freezer. Centrifuge the samples at 6,700 x g for 10 min. Remove and discard the supernatant. Add 200 μl of enzymatic lysis buffer to the pellet and vortex to resuspend. Incubate the samples at 56 °C for 30 min. Centrifuge briefly (5 sec) at 6,700 x g to collect liquid at the bottom of tube. Add 10 μl of 20% SDS to complete the cell lysis and mix gently at room temperature for 2 min. Add 4 μl of RNase A (100 mg/ml stock) and mix gently (on a rocker or by inverting the tubes) at room temperature for 2 min. Add 200 μl of buffer AL (from kit) and vortex for 15 sec. Incubate samples at 70 °C for 10 min. Centrifuge briefly (5 sec) at 6,700 x g to collect liquid at the bottom of tube. Add 200 μl of 100% EtOH and vortex for 15 sec. Spin briefly to collect the liquid at bottom of tube, then transfer the mixture (including any precipitate) to the spin column (in a 2 ml collection tube) without wetting the rim. Follow wash steps according of the manufacturer’s protocol (not shown here). To elute DNA, transfer column into a labeled microfuge tube, add 50 μl of Buffer AE (from kit), and incubate at room temperature for 2 min. Centrifuge at 4,300 x g for 1 min. Repeat once for a final elution volume of 100 μl. DNA can be stored at -20 °C until use. To perform qPCR, sterilize the hoods with UV light for 15 min prior to start. Preparing a 96-well plate map worksheet to record well locations for each sample is recommended. Prepare standard curve using a 10 ng/μl stock of genomic pneumococcal DNA (extracted from reference strain ATCC 6305). Thaw pneumococcal stock DNA and spin down briefly (5 sec) in a tabletop centrifuge. Perform 1:10 serial dilutions in 6 prelabeled microfuge tubes by adding 3 μl DNA to 27 μl nuclease-free H2O, changing tips and vortexing between each dilution. The final dilution series consists of 6 tubes: 1, 0.1, 0.01, 0.001, 0.0001, and 0.00001 ng/μl. Note: These can be stored at 4 °C for up to one week. Prepare lytA mastermix as follows in a sterile 15 ml conical tube in a sterile PCR hood. Thaw components on ice and vortex immediately prior to use. Note: Some real-time PCR machines require the use of a reference dye, which is contained in some commercial mastermixes or can be added separately. This protocol is designed for running 25 μl reactions in a 96-well plate but can be adjusted to accommodate different real-time PCR machines. The primers and probe sequences were originally published by Carvalho et al.15 and are shown in the list of materials. Vortex and load 23 μl/well of the lytA mix into the appropriate wells. Refer to plate map. Transport plate to template addition area (preferably a sterile cabinet in a separate room) for sample loading. Use a P2 pipette to load samples, changing tips for each well. All samples are run in duplicate. Refer to plate map for location. For standard curve wells, add 1 μl/well of the appropriate dilution of standard curve DNA plus 1 μl/well H2O to bring the final volume to 25 μl. For no template control wells, add 2 μl H2O. Add 2 μl/well of sample DNA into appropriate wells. Cap all wells in use. Make sure caps are closed snugly. Quickly spin the PCR plate (5 sec) before loading the plate into a real-time PCR machine. Collect data and quantify pneumococcal DNA using the standard curve. Bacterial loads are calculated as previously described17, estimating that 1 pg of genomic DNA is equivalent to 447.4 cells, and reported as CFU/ml (assuming one genome per CFU, and one copy of lytA per genome; see Figure 4). For a successful assay, the R2 value should be ≥0.98 and all positive results within the range of the standard curve (cT values less than that obtained for the 0.00001 ng/μl standard curve point are considered background/lytA negative). Note: Some real-time PCR systems come with analysis software that can be used to construct standard curves and calculate unknowns. Otherwise, these calculations can be performed in Excel or similar programs. An example standard curve is shown in Figure 4. To calculate pneumococcal adherence, normalize the number of adherent pneumococci from condition b. CCL-23 cells + pneumococci to 100%, and compare adherent pneumococci from other conditions to this condition. Results from a representative experiment in which pneumococci (S. pneumoniae PMP843, a colonizing 19F isolate) were added to CCL-23 cells 1 hr after the addition of S. salivarius, and pneumococcal adherence was quantified by both viable count and lytA qPCR are shown in Table 2. Results were consistent between the two methods for both the absolute number of bacteria (presented as CFU/ml) and the % adherence, normalized to the number of adherent pneumococci in the wells containing pneumococci alone. Heparin is used as a control as it is known to inhibit pneumococcal adherence and therefore the reduced adherence in the pneumococci + heparin condition (typically <40% compared to pneumococci alone) is indicative of a successful assay. S. salivarius inhibits pneumococcal adherence in a dose-dependent manner, as shown in Table 2, where the high concentration of S. salivarius (approximately 10 S. salivarius : 1 pneumococci) resulted in the lowest pneumococcal adherence. Figure 5 shows the adherence of pneumococci to CCL-23 cells when S. salivarius is added 1 hr before pneumococci (preaddition), concurrently (coaddition), or 1 hr after pneumococci (post-addition). S. salivarius is more effective at inhibiting pneumococcal adherence when added prior to pneumococci, as both the high and medium doses of S. salivarius significantly reduced pneumococcal adherence in the preaddition assay (Figure 5A), whereas only the high dose of S. salivarius inhibited pneumococcal adherence in the coaddition and post-addition assays (Figures 5B and 5C). The data shown in Table 2 and Figures 4 and 5 were obtained using an earlier version of the lytA qPCR primers and probe17. The current protocol describes the updated qPCR assay. Figure 1. Representative growth curves of S. pneumoniae PMP843 (A) and S. salivarius K12 (B). For each species, CFU/ml as determined by viable counting is shown in black (left y-axis), and optical density (OD) at 600 nm is shown in grey (right y-axis). Mid-log phase was estimated by viable counting to be 3 hr for S. pneumoniae PMP843 and 2 hr for S. salivarius K12. Click here to view larger image. Figure 2. 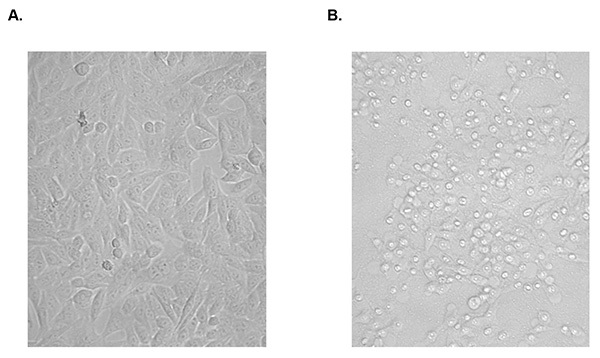 Examples of healthy CCL-23 cells and CCL-23 cells with cytopathic effects (CPE). A) Example of a healthy, confluent monolayer of CCL-23 cells. B) CCL-23 cells with cytopathic effects. Note rounding of cells, bright intracellular regions, and areas of disrupted monolayer where cells have lifted off the plate. Images were taken using an inverted light microscope at 200X magnification. Click here to view larger image. Figure 3. S. salivarius and pneumococcal colonies on horse blood agar. 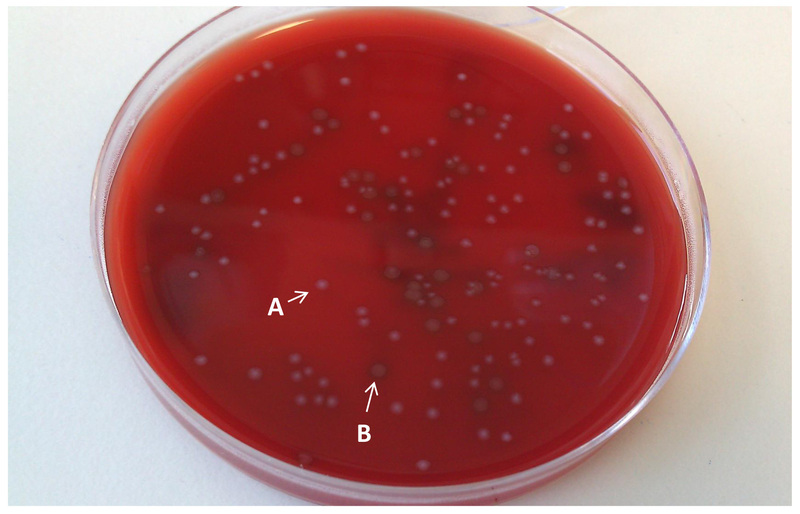 S. salivarius colonies are small and white, as indicated by the white arrow and letter A. Pneumococcal (S. pneumoniae) colonies are typically larger, flatter, and greenish in colour, as indicated by the white arrow and letter B. Click here to view larger image. Figure 4. Example S. pneumoniae standard curve for qPCR. 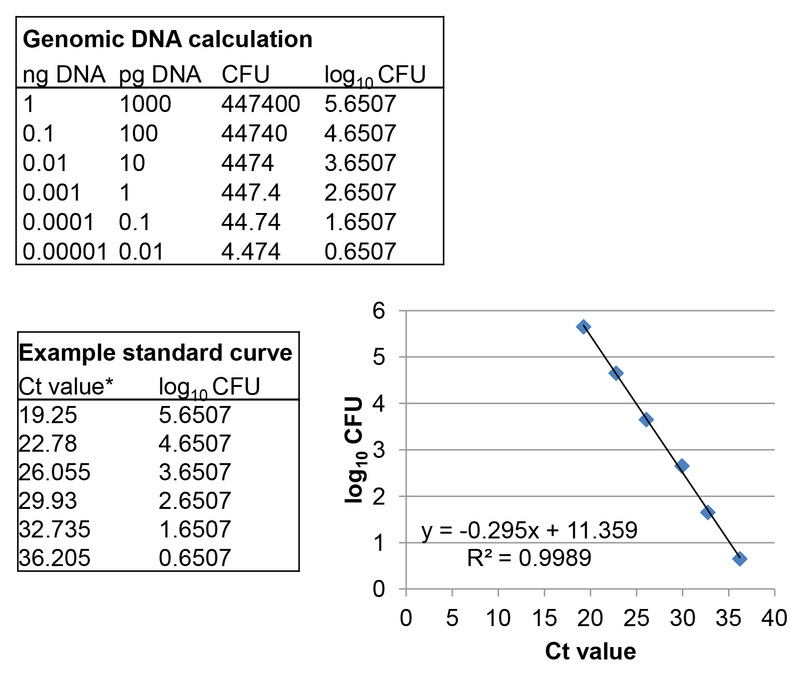 Genomic DNA calculations are shown along with Ct values (* average of duplicate standard curve wells from a representative qPCR assay), with the resultant standard curve, equation, and R2 value shown on the graph. Click here to view larger image. Figure 5. Effect of S. salivarius on pneumococcal adherence to CCL-23 cells. Pneumococcal adherence to CCL-23 cell monolayers when cells were incubated with pneumococci alone (Pnc; normalized to 100%), with pneumococci and 100 U/ml heparin (heparin), or with pneumococci and S. salivarius added at a ratio of ~10: S. salivarius : 1 pneumococci (high), ~1 S. salivarius : 1 pneumococci (medium), or ~1 S. salivarius : 10 pneumococci (low). S. salivarius was added 1 hr before (A), at the same time as (B), or 1 hr after pneumococci (C). n ≥ 3, * indicates P < 0.05 when compared to pneumococci alone (Student's t test). Click here to view larger image. Table 1. Conditions tested in pneumococcal adherence assay. The six basic assay conditions are described here. Table 2: Pneumococcal adherence to CCL-23 cells following the addition of S. salivarius as determined by lytA qPCR and viable count method. * Pnc = pneumococci; Sal = S. salivarius; [high] = approximately 10 Sal : 1 Pnc; [med] = approximately 1 Sal : 1 Pnc; [low] = approximately 1 Sal : 10 Pnc. A critical portion of this assay is adding the appropriate concentrations of S. salivarius and pneumococci in sections 3.1.7 and 3.1.12. Concentrations are estimated using OD readings but the exact inocula are not determined until plates are counted the following day. For this reason, we recommend performing growth curves to measure OD and viable counts (CFU/ml) over time for all bacterial strains used in the assay to identify the mid-log phase and assist in estimating concentration by OD. Additionally, pneumococcal strains can differ substantially in their adherence properties. Strains with good adherence (>10% of inocula adhering to epithelial cells after a 3 hr incubation) are recommended for assays investigating the ability of probiotics to inhibit pneumococcal adherence. Even when performed by an experienced operator, adherence levels can vary assay to assay, as evidenced by the relatively large error bars seen in Figure 5. For this reason we recommend a minimum of three repeats for each experiment, with duplicate wells for each assay condition. Similar variability has been reported in adherence assays using Escherichia coli18. In this protocol, cells are incubated for 3 hr following the addition of pneumococci. The incubation time may be shortened if adherence time course experiments are performed and show that the majority of bacteria adhere during the first hour of incubation. This protocol presents two methods for quantifying pneumococcal adherence, qPCR and viable counting. Both methods are suitable, and the choice depends on the operator's preference and available lab equipment (e.g. access to a real-time PCR machine). Quantification by viable counting is a low-cost method that does not require additional reagents or a real-time PCR machine. However, it uses many plates (typically 80 plates for a 12-well assay) and must be performed immediately at the end of the assay, and counting pneumococcal colonies can be difficult on plates that contain a large amount of S. salivarius. Quantification by qPCR is more expensive and requires a lengthy DNA extraction step, but samples can be stored frozen and processed in batches, increasing efficiency. The extracted DNA could also be used for other purposes, such as qPCR detection of adherent S. salivarius. If investigating S. salivarius adherence, it is recommended to include wells with CCL-23 cells plus S. salivarius (without pneumococci) and wells with CCL-23 cells plus S. salivarius and heparin as additional controls. The basic assay can also be adapted to investigate other scientific aspects of colonization. For example, the effect of probiotics on cytokine production can be assessed by storing and assaying cell supernatants. The assay can also be modified to examine bacterial invasion rather than adherence by incubating cells with cell membrane impermeable antibiotics to kill extracellular bacteria prior to harvesting and lysing cells. As described here, the assay does not distinguish between adherent and invasive (internalized) pneumococci. However, previous studies have found the levels of internalized pneumococci to be very small (typically ≤0.01% of inocula)10 so for most isolates (including PMP843), the vast majority of cell-associated pneumococci are adherent rather than internalized. Additional applications include testing other probiotic species for the ability to inhibit colonization, and/or looking at mutant bacterial strains to investigate the role of specific genes of interest. An obvious limitation of this in vitro assay is that it does not include an established epithelium, immune cells, normal flora, or other factors that likely influence pneumococcal colonization in vivo. To fully evaluate whether probiotics could be useful in preventing pathogen colonization in the respiratory tract, in vivo studies using animal models and human clinical trials are warranted. Nevertheless, in vitro adherence assays serve as a useful screen for identifying probiotics with the potential to inhibit pneumococcal adherence and can provide information on preferential dosing strategies, as well as providing an experimental model that can be used for mechanistic studies. This work was supported by funding from the Murdoch Childrens Research Institute and the Victorian Government’s Operational Infrastructure Support Program. O'Brien, K. L., et al. Burden of disease caused by Streptococcus pneumoniae in children younger than 5 years: global estimates. Lancet. 374, 893-902 (2009). Bogaert, D., de Groot, R., Hermans, P. W. M. Streptococcus pneumoniae colonisation: the key to pneumococcal disease. Lancet Infect. Dis. 4, (04), 144-154 (2004). Weinberger, D. M., Malley, R., Lipsitch, M. Serotype replacement in disease after pneumococcal vaccination. Lancet. 378, (10), 1962-1973 (2011). Jacoby, P., et al. Modelling the co-occurrence of Streptococcus pneumoniae with other bacterial and viral pathogens in the upper respiratory tract. Vaccine. 25, 2458-2464 (2007). Kwambana, B., Barer, M., Bottomley, C., Adegbola, R., Antonio, M. Early acquisition and high nasopharyngeal co-colonisation by Streptococcus pneumoniae and three respiratory pathogens amongst Gambian new-borns and infants. BMC Infect. Dis. 11, (2011). Licciardi, P. V., et al. Protecting against pneumococcal disease: critical interactions between probiotics and the airway microbiome. PLoS Pathog. 8, (2012). Popova, M., et al. Beneficial effects of probiotics in upper respiratory tract infections and their mechanical actions to antagonize pathogens. J. Appl. Microbiol. 113, (6), 1305-1318 (2012). Pracht, D., et al. PavA of Streptococcus pneumoniae modulates adherence, invasion, and meningeal inflammation. Infect. Immun. 73, 2680-2689 (2005). Adamou, J. E., Wizemann, T. M., Barren, P., Langermann, S. Adherence of Streptococcus pneumoniae to human bronchial epithelial cells (BEAS-2B). Infect. Immun. 66, 820-822 (1998). Wong, S. S., et al. Inhibition of Streptococcus pneumoniae adherence to human epithelial cells in vitro by the probiotic Lactobacillus rhamnosus GG. BMC Res. Notes. 6, (1), 135 (2013). Wescombe, P. A., Heng, N. C. K., Burton, J. P., Chilcott, C. N., Tagg, J. R. Streptococcal bacteriocins and the case for Streptococcus salivarius as model oral probiotics. Future Microbiol. 4, 819-835 (2009). Di Pierro, F., Adami, T., Rapacioli, G., Giardini, N., Streitberger, C. Clinical evaluation of the oral probiotic Streptococcus salivarius K12 in the prevention of recurrent pharyngitis and/or tonsillitis caused by Streptococcus pyogenes in adults. Expert. Opin. Biol. Ther. 13, (3), 339-343 (2013). Fiedler, T., et al. Protective mechanisms of respiratory tract streptococci against Streptococcus pyogenes biofilm formation and epithelial cell infection. Appl. Environ. Microbiol. 79, 1265-1276 (2013). Slotved, H. C., Satzke, C. In vitro growth of pneumococcal isolates representing 23 different serotypes. BMC Res. Notes. 6, 10-1186 (2013). Carvalho, M. dG. S., et al. Evaluation and improvement of real-time PCR assays targeting lytA, ply, and psaA genes for detection of pneumococcal DNA. J. Clin. Microbiol. 45, 2460-2466 (2007). Tonnaer, E. L. G. M., et al. Involvement of glycosaminoglycans in the attachment of pneumococci to nasopharyngeal epithelial cells. Microbes Infect. 8, 316-322 (2006). Smith-Vaughan, H., et al. Measuring nasal bacterial load and its association with otitis media. BMC Ear Nose Throat Disord. 6, (2006). Letourneau, J., Levesque, C., Berthiaume, F., Jacques, M., Mourez, M. In vitro assay of bacterial adhesion onto mammalian epithelial cells. J. Vis. Exp. (2011).